When a group of neighborhood women gathers, wine in hand, around a fire pit where their backyards meet one Saturday night, most of them are just ecstatic to have discovered that their baby monitors reach that far. It’s a rare kid-free night, and they’re giddy with it. They drink too much, and the conversation turns personal. Everyone knows something about everyone else in the quirky small Ohio town of Yellow Springs, but no one can make sense of the disappearance. Kristin was a sociable twin mom, college administrator, and doctor’s wife who didn’t seem all that bothered by her impending divorce—and the investigation turns up more questions than answers, with her husband, Paul, at the center. For her closest neighbor, Clara, the incident triggers memories she thought she’d put behind her—and when she’s unable to extract herself from the widening circle of scrutiny, her own suspicions quickly grow. But the neighborhood’s newest addition, Izzy, is determined not to jump to any conclusions—especially since she’s dealing with a crisis of her own. 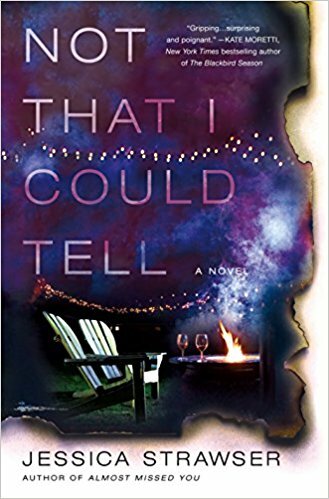 Review: A group of women gather for a night of drinking and the next morning, one of them has disappeared with her two young children. Kristin was in the middle of a divorce, did her ex have something to do with her disappearance or did she leave on her own? The book primarily follows neighbors Clara (Kristin's closest friend) and Izzy (another neighbor hung up on her brother-in-law) in the aftermath. We are treated to a few very short sections from Kristin's point of view leading up to the disappearance. This book reminded me a lot of Big Little Lies, unfortunately without the humor or engaging story line. While this book deals with an important topic and really nails how things can appear perfect on the outside but anything can happen behind closed doors, it was incredibly slow, boring and predictable. This had a lot of potential but fell flat for me.